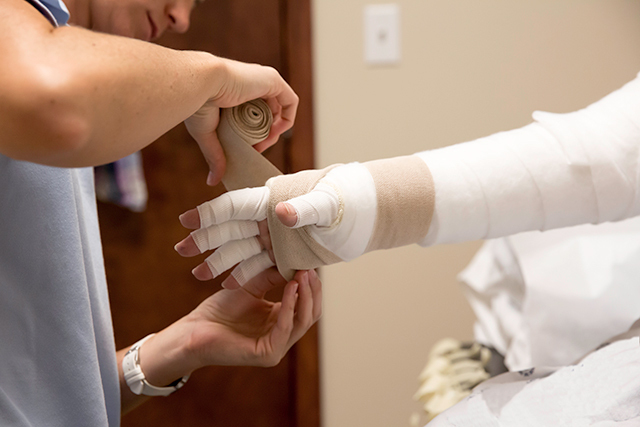 A patient receives traditional lymphedema therapy. Prospective surveillance with bioimpedance spectroscopy (BIS) leads to low rates of chronic breast cancer-related lymphedema (BRCL) in high-risk patients with breast cancer, according to a study presented at the 2017 San Antonio Breast Cancer Sympossium (SABCS 2017). Bioimpedance spectroscopy is a noninvasive test that sends currents of various frequencies through the body to detect the amount of fluid outside the cells and the overall water content of the body. The study consisted of 30 patients, median age 57.5 years, who underwent axillary lymph node dissection (ALND) between August 2010 and December 2016. BIS measurements were taken preoperatively and at regular intervals postoperatively. Other additional high-risk features included axillary radiation, a high body mass index, or the use of taxane-based chemotherapy. Altogether, 86% of patients had 1, 70% had at least 2, and 23% had all 3 additional high-risk features. During the study, 7 patients (23%) had an elevated L-Dex score that increased from baseline by more than 10, indicating subclinical BRCL, and were treated with over-the-counter compression sleeves for 4 weeks. Kaufman D, Shah C, Vicini F. Low rates of chronic breast cancer related lymphedema (BCRL) in a cohort of high-risk patients undergoing prospective surveillance with bioimpedance spectroscopy (BIS). Poster presentation at: 2017 San Antonio Breast Cancer Symposium; December 6-9, 2017; San Antonio, TX. Abstract P3-14-09.